Adapting best-selling novels for the screen is always fraught with danger. Luckily for me, I didn't have to worry about any of the potential problems with the film adaptation of David Nicholls' novel 'One Day', having not read the source material. Instead, I simply went in the cinema and came out having seen a fairly inoffensive romantic drama with aspirations of being a mainstream version of '(500) Days Of Summer'. 'One Day' director Lone Scherfig has some past form in the area of novel adaptations, with her Oscar-nominated work on 'An Education'. Unfortunately, 'One Day' falls considerably short of the latter, despite the original author penning the screenplay. The film charts the lives of Emma (Anne Hathaway) and Dexter (Jim Sturgess) over the course of twenty years as they meet on St Swithen's Day, July 15th, each year. Scherfig uses quaint title sequences to represent the chronology, certainly reminiscent of (500) Days Of Summer both in style and (to a small extent) narrative structure. The film begins on 15th July 2006, choreographing a particularly important event that would forever affect Emma and Dexter, before transporting the viewer back to 1988 and the inception of the duo's stumbling romance. The rest of 'One Day' taunts us with the "will they, won't they" romantic device as the years go by and the characters rise and fall on their converging/diverging paths. The banality of the central romance hardly engaged me, and the film lacked the emotion of something like '(500) Days Of Summer'. Even if that film's overriding feeling was that of bitterness. Anne Hathaway's fluctuating accent is supposedly indicative of her character's Yorkshire upbringing. Supposedly. Thankfully, the rest of her acting performance is more consistent, although I would have loved to have seen someone like Rebecca Hall take on this role. Jim Sturgess is competent throughout, revelling in Dexter's obnoxious television personality to his darkest lows. Ironically, it's Rafe Spall's character that proves most engaging - there is something oddly inspiring about his pursuit to be comedian, inspite of a lack of a sense of humour, and his somewhat Pyrrhic success in snaring Emma. I guess 'One Day' is one of those films where you see a bit of the characters in yourself. Or in my case, I realised I'm a lot like Spall's character. I'll never be a Dexter. But I don't want to be. The facade of his character having a good heart failed to fool me. Emma is not much better, stringing along Spall's character when she knew they had no future and becoming a pretentious so-and-so after her career takes an upturn. 'One Day' presents itself as a heartfelt, layered romantic drama with a smattering of offbeat humour. But it ends up at a crossroads - not a feelgood film, not a comedy and not particularly tearful. It's not bad filmmaking but it simply fails to stir the emotions in the same manner as the source material has done. 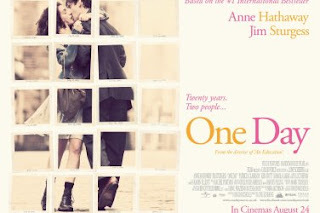 'One Day' is on wide release throughout UK cinemas now.